Each team portrait is an impressive 18.5” in height by 22’’ in length and modeled after Helmar Brewing’s ever-popular 6-Up Die Cut Series. Each portrait is hand crafted using a proprietary process, which creates a finished piece that is substantial, measuring approximately .25 inches thick using 8 layers of construction. The obverse of the portrait comprises a period-relevant background meaningful to the team’s home city and three rows of individual oval-shaped player portraits (totaling 19 players), each measuring approximately 2.5” in height and 2” in width. 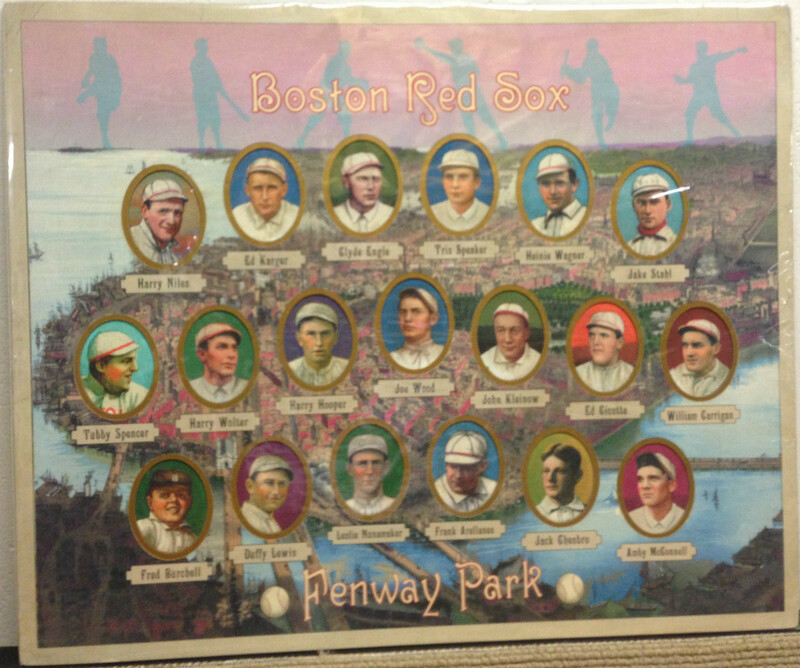 Featured Red Sox player portraits include: Speaker, Stahl, Hooper, Wood, Cicotte, Carrigan, and Chesbro. 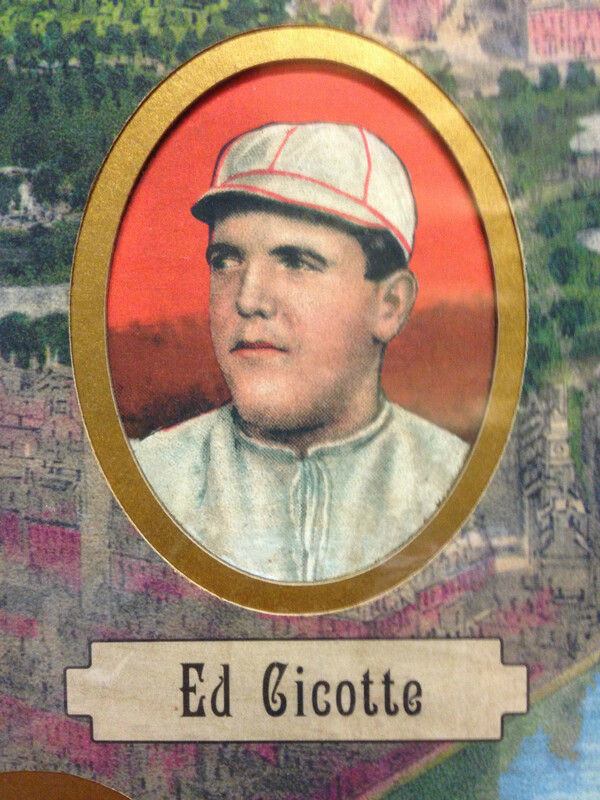 The player portraits are recessed (die cut) and outlined beautifully with Gold Borders. The official team name – Boston Red Sox – is shown at the top and the name of it home field – Fenway Park – is shown at the bottom. Sometimes baseballs are positioned next to the team name and/or field name. See pictures. The reverse of each team portrait includes the team’s 1910 schedule with results (won/loss/tied and score) on the right side as well as picture of Helmar Brewing’s BIG LEAGUE BrewTM with a Christy Mathewson label on the left side. See pictures. Each team portrait is a distinctive creation using new designs from Helmar Brewing; individual player portraits are reminiscent of old T205 and T206 tobacco cards. All the baseball greats from yesteryear from Cobb to Jackson to Johnson to Mathewson to Wagner to Young are in this series. Paper stock consistent with the early 20th century is used to fashion each portrait. The portrait is then antiqued and mildly distressed to give it the traditional Helmar Brewing worn, well-loved look. You will feel as if you are holding a vintage portrait in your hands. Because each portrait is hand crafted, no two portraits look exactly the same. Finally, each portrait is hand numbered. Teams can be purchased individually or as a complete set. Ten (10) complete matching-numbered sets are being held in reserve for set collectors, which is a first for a Helmar Brewing endeavor. The entire series took well over a year to conceive and produce. Get your team portrait now!! Price is a very reasonable $225.00per portrait, plus $20 for shipping. These portraits are available only through Let’s Play Two Collectiblesand are extremely limited with only 20 portraits per team. These portraits will not be offered again. Once they are gone, they are gone. Call Let’s Play Two Collectiblesat +1.703.888.8311if you are interested in a complete set.